Since 1997, JustMyVoice Production has provided clients with audio projects recorded by a male voice-over talent. We’re able to record anything from commercials, to educational programs, to on-hold messages. Whatever you need, we’ll provide you with the final product in a timely manner. JustMyVoice Production is run by Rich Brennan, a male voice-over talent, located in the New York City area. He’s worked on over 3,000 recordings, including commercials, voice prompts, narrations, audiobooks and more. In addition, he has numerous contacts in the industry and is passionate about the work he does. It’s no wonder that JustMyVoice Production has made a name for itself. 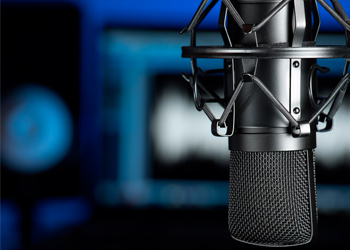 JustMyVoice Production is known for its professionalism, quick turnaround time, and exceptional voice recordings. Male voice-over acting is a process that has a lot of intricate steps. Fortunately, JustMyVoice Production knows how to expertly handle each one, as well as any surprises that may occur along the way. Our male voice-over talent takes the time to communicate with our customers, envision the script as a voice over, and do any additional research if needed. There’s a lot of planning that goes into each and every recording so it can perfectly match the vision you have. Besides providing male voice-over talent, we also offer an array of other services. These include script writing and radio commercial production. If you’re unsure of what words you’d like to convey in your next advertisement or program, let JustMyVoice Production do the writing for you. We’ll be able to easily create a script based on just a few points of information you send us. Most importantly, JustMyVoice Production will work closely with you to establish the tone you’d like. This is the best way to ensure that you’ll have an audio production that complements the image of your business. Meanwhile, our commercial production perfectly complements any recordings our male voice-over talent creates for you. If your script needs background music and sound effects to truly convey your message, JustMyVoice Production will be able to provide them with no problem. That’s because our organization has a large library of royalty free music and sound effects that can be utilized in our recordings, that’ll make your commercial truly stand out among the rest. Because our male voice-over talent has access to thousands of sound files, we’ll help you find exactly what you need to fit your commercial. We’ve worked with a wide variety of businesses and are confident that our male voice-over talent can successfully complete any project. We will analyze your script carefully to determine the best male voice-over talent narration tone to fulfill what you’re looking for. In addition, because we’re passionate about male voice-over talent, you’re sure to receive a recording that you’ll love. JustMyVoice Production consistently stays informed about any new updates in the industry so you can be a better informed customer. Rely on JustMyVoice Production for a male voice-over talent for your project. Give us a call now at 516-454-0859 and discover how quickly we can get your audio production to you. We look forward to working on your next project with you. It’ll be exactly what you’re looking for! Our male voice-over talent will give your advertisement the professional feel it needs to appeal to your audience. We will also deliver (depending on the project size) the finished audio of male voice over talent within 24 hours. Male voice-over talent is available for all kinds of projects. Talented, professional, experienced.